This is an early work by Mashile (plate 41), painted when he was only 20, some time between his completing high school and enrolling at the Johannesburg Art Foundation. As might be expected, it is a good example of a young artist’s struggling to come to terms with observational painting and the issues of naturalism. The immediacy of this painting suggests that it is observed from an actual scene. Although it shows a talented and deft handling of the brush, and Mashile’s confidence in handling broad planes of colour, there is some difficulty in handling scale, as can be noted from the quickly-articulated human figures when seen in relation to the buildings. 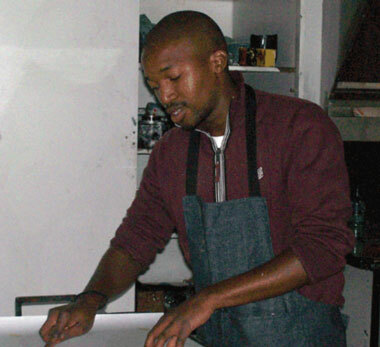 In 1998 Mashile’s work shifted notably in new directions, becoming more ‘symbolist’ in nature; dealing with his issues and interests in traditional initiation rituals and male circumcision. These are in fact central to the life of young black men. These significant explorations, combined with a certain fluency in handling of the medium of painting, attracted enthusiastic critical attention. Mystical and natural forms replaced the more conventional and observational work of his earlier years. This is yet another example of Campbell Smith’s penchant for collecting the atypical and earlier examples of an artist’s work. Born Bushbuckridge, Limpopo Province, 1972. Training 1989: Tladishi High School (Matriculation); 1994: Johannesburg Art Foundation; 2000: Awarded a BA Fine Arts degree, University of the Witwatersrand; 2001: Postgraduate Diploma in Heritage Studies, University of the Witwatersrand; 2002: Studied printmaking at the David Krut Printmaking Workshop. Awards ABSA Atelier Merit Award. Selected Exhibitions 1998–1999: Martienssen Award Exhibition, University of the Witwatersrand; 2000: UNISA Art Gallery, Pretoria; 2000: Klein Karoo Arts Festival; 2001: Museum Afrika Gallery; 2002: Art on Paper Gallery, Melville, Johannesburg; 2003: Circumcised/Circumscribed,/em>, Axis Gallery, New York; 2004: A Decade of Democracy: South African Art 1994–2004 from the Permanent Collection, Iziko SA National Gallery; 2006: NSA Gallery, Durban; 2006: International Exhibition, Dakar Biennale. 2006: David Krut Arts Resource: Monotypes and Linocuts. Collections Durban Art Gallery; Iziko SA National Gallery; The Mandela Foundation; SABC Collection; Johannebsurg Art Gallery; BHP Billiton Collection; Sasol Art Collection; MTN Collection; Galleries of the University of the Witwatersrand. Photograph courtesy of Artist Proof Studios.